If you conduct a Teach Ag Workshop, please share your experience in our Teach Ag Community on NAAE's Communities of Practice. We would love to hear how it went for you, and welcome any additional materials you would like to share for this resource area. 6 hour workshop that focuses on the how and why of being an ag teacher. IA Change Lives Workshop Outline — Contact Brittany Elmquist, Harlam Community High School Activities include Play-doh, tower building, snowball war, future ag teachers creed. Activities Include; campus tour, lunch with state staff, panel discussion, scholarship. IA Change Lives Invitation Letter — Letter used to send students an invitation to the Change Lives workshop after being nominated. MN Advisor Letter Sample — Sample letter for advisors to use when creating a personalized letter to the student they nominate for the workshop. 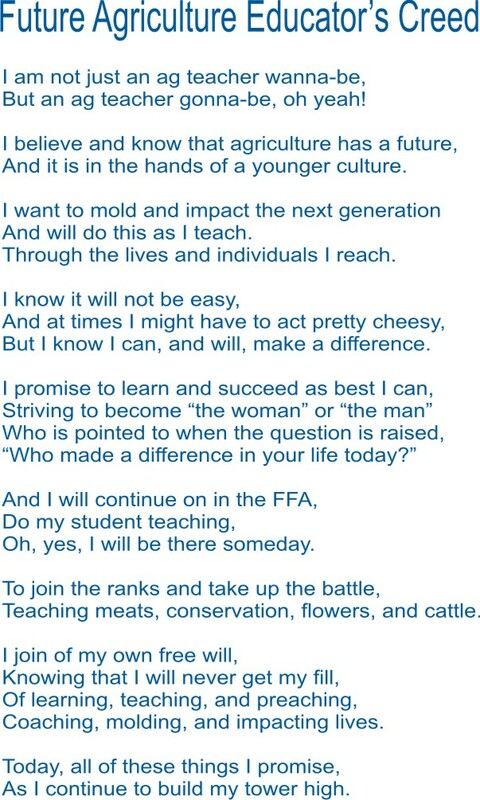 MN Change Lives Student Invite Letter — draft copy of the letter that students who were nominated receive inviting them to the Teach Ag workshop. Skit Topics — list of potential topics for students to choose from to make their ag education skit, ready to be posted around the room. Attendee Contact Form -- Use this form to capture workshop attendees contact information for follow-up and tracking. Attendee Folder Items — Checklist of possible items to include in folders to give to students who attend Teach Ag workshops.